Most economists and financial analysts believe that central banks set interest rates. 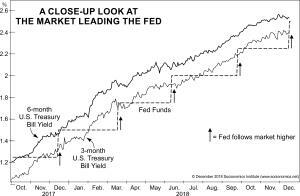 For more than two decades, Elliott Wave International has tracked the relationship between interest rates set by the marketplace and interest rates set by the U.S. Federal Reserve and found that it’s actually the other way around—the market leads, and the Fed follows. Elliott Wave International (EWI) is the largest independent financial analysis and market forecasting firm in the world, with approximately 100 employees spread throughout the country. EWI's 24 full-time analysts cover every major market (stocks, currencies, bonds, energy, metals, commodities) worldwide, 24 hours a day on our website and proprietary web systems like Bloomberg. The company's subscriber base includes the world's major banks, money managers, hedge funds, insurance companies and pension funds as well as tens of thousands of individual investors. EWI's free online Club EWI community has over 350,000 members and our website consistently ranks among the top 50 financial websites according to Alexa rankings. EWI’s educational services include conferences, workshops, webinars, DVDs, streaming videos, special reports, books and one of the internet’s richest free content programs, Club EWI. The company recently launched its certification program (CEWA) for aspiring professional wave analysts. Elliott Wave International is not affiliated with any brokers, money managers or other institutions and collects no brokerage or money management fees. EWI's independence allows the firm to remain dedicated to unbiased market analysis.